I am relieved to say that the first draft of my novel is now with my editor! Yes, the first step in the long publishing process has begun, but "Every journey must begin with a first step," is how the Chinese proverb goes, right? But getting to that first step was pretty hard! After missing, um, three years of deadlines I was finally determined to make this last one. However, as I was nearing the end, I needed huge, extended chunks of uninterrupted time and that is something I can't get at home, so I was starting to feel a bit desperate. And that is where my good friend and fellow author Libby Koponen stepped in. Offering me her spare room in her place by the sea (very apropos for my book), we created our own two-person writing retreat. 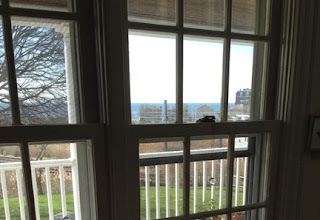 the view from my borrowed writing desk! 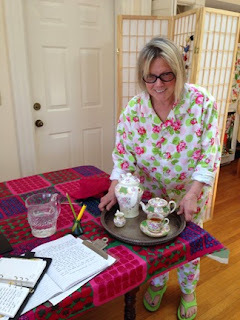 Fresh tea every couple of hours and a pajama dress code! And we both got a lot of writing done! I worked from the wee hours of the morning to the wee hours at night--I slept less than when Rain Dragon was a baby! But, (as you know, but I must repeat it because I am a bit disbelieving) I finished my first draft! I watched the sun rise! It went so well that we are talking about running real writing retreats, offering it to other authors besides ourselves. I think it would be great, don't you? But in the meantime, I am just thankful that I had this one! 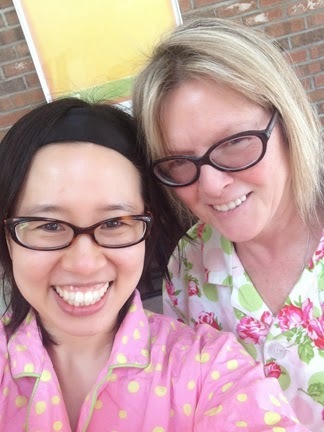 two writers in our work uniforms!